18. 02. 2018 12:51 19 (3 - Suninen Teemu / Markkula Mikko): We learned a lot, the positive thing is we are fastest Ford, but I'm not satisfied to finish eighth. Now we try and take these leanings into the rest of the year. 18. 02. 2018 10:15 18 (3 - Suninen Teemu / Markkula Mikko): Better now, I was using the car more, getting used to the new setups. Small problems with the wipers, but ok.
18. 02. 2018 08:14 17 (3 - Suninen Teemu / Markkula Mikko): Happy with the car, some improvement to the setup. More grip than I expected. 17. 02. 2018 19:44 16 (3 - Suninen Teemu / Markkula Mikko): I was a bit careful in here - a lot of ruts under braking. 17. 02. 2018 18:08 15 (3 - Suninen Teemu / Markkula Mikko): It was not my favourite one. Not the best confidence. We need to improve tomorrow. 17. 02. 2018 15:40 14 (3 - Suninen Teemu / Markkula Mikko): Difficult stage. Just need to improve and do a better job. 17. 02. 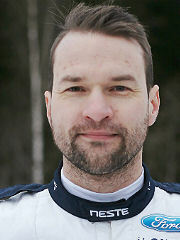 2018 14:42 13 (3 - Suninen Teemu / Markkula Mikko): Shame for Tänak. Quite ok for us, but difficult to drive in the ruts. 17. 02. 2018 13:16 12 (3 - Suninen Teemu / Markkula Mikko): Now it feels a bit better but the conditions are difficult, no ice for the rear tyres and we are sliding about. Can Kris catch me? Let's see. 17. 02. 2018 10:37 11 (3 - Suninen Teemu / Markkula Mikko): We hit the snow bank a bits, so not a great stage. 17. 02. 2018 09:43 10 (3 - Suninen Teemu / Markkula Mikko): That was a bad stage for me - I spun. 17. 02. 2018 08:22 9 (3 - Suninen Teemu / Markkula Mikko): We had some problems. Car problems? Ah. Maybe the driver. 16. 02. 2018 17:24 8 (3 - Suninen Teemu / Markkula Mikko): Not really good. We lost our light pod in here. Today would have been okay, but I was hoping for more. I need more kilometres to find a good rhythm. 16. 02. 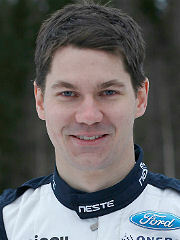 2018 14:12 5 (3 - Suninen Teemu / Markkula Mikko): I was struggling a lot with the rear - difficult to keep it in the ruts. 16. 02. 2018 10:25 4 (3 - Suninen Teemu / Markkula Mikko): Better driving, and now I try to push a bit more. Tight competition here in Sweden. 16. 02. 2018 09:43 3 (3 - Suninen Teemu / Markkula Mikko): It was ok. A lot of grip. Better, but everyone is improving. 16. 02. 2018 08:29 2 (3 - Suninen Teemu / Markkula Mikko): Not the best one, struggling to find the braking points and apexes. 15. 02. 2018 20:41 1 (3 - Suninen Teemu / Markkula Mikko): Nice to be back in this car. It's difficult to find the rhythm in this class.